My last blog entry was dated January 7th, and I apologize for that. I didn't die. But, it seems, I came pretty close. Here's what happened. First, a prologue. I don't know if this is a significant part of the story or not. But Jason and I needed a bed. (I gave the king-sized bed to my ex, Michael.) Jason and I wanted a waterbed, and I found one, a queen-sized soft sided one, on CraigsList. We looked at it, liked it, and brought it home. However, we were going camping so we left the bed in the garage, rolled-up, to put up when we got back. Which we did. But note: The bed sat in the garage over the weekend. We put it up January 10th. It was very comfortable, even though the mattress was the fiber type that doesn't move much when the bed's occupants do. When we sleep, Jason and I like to tangle our feet together. On Tuesday or Wednesday night, I moved my foot slightly and felt something sharp. "Jason!" I said. "It's time to trim your toenails, dude." "But I just did," Jason replied. I reached down and checked, and sure enough, his nails were smooth. So we fell asleep and I didn't give it another thought. I certainly didn't think I might have been bitten by a spider. When we went to bed Thursday night, I felt really great. I had no way of knowing it was the last time for many months I would feel that way. Jason and I normally got up at 4:30 so we could get to our respective jobs on time. However, on Friday morning, January 14th, I awoke at 4:00 am shivering violently. I stepped into the shower in hopes hot water would warm me up. It didn't. Since I was obviously sick, Jason called Michael in from his room. They saw me throw up in the shower. I don't remember doing that, so I probably had about a 103° fever at this point. I haven't had a cold or the flu in over 15 years, a fact I attribute to getting enough sleep and taking vitamin and mineral supplements. However, it looked like I had the flu now. Jason had to go to work and Michael had to go to school, so after making sure my phone was handy and I knew to call him if I had to, Jason left and I went back to sleep. When I awoke I was feverish and couldn't think straight. When I tried to get up to go to the bathroom, my left leg—yes, the one that had felt "something sharp"—pained me something fierce. I hobbled back to bed in such discomfort I considered calling Jason, even though it would be an hour before he could get back to me. Michael was closer, but he was in class and would have his phone off. I was thirsty but in too much pain to get anything to drink. My head ached and I couldn't think. I tried reaching my phone, fumbled it, and it fell to the floor, dislodging the battery. The idea of reaching for it and correctly putting the battery back in was more than I could bear, so I did nothing. Jason finally made it home about 3:30 pm. He took my temperature, which was nearly 103°. It was clear I needed to go to the emergency room. I insisted on going to the naturopathic clinic. I was sure all I needed was one of their terrific vitamin/supplement bags, such as Dr. Crinnion had given me when I had shingles, which cleared that condition up in a week (instead of the up-to-eight-weeks allopathic medicine requires). However, Dr. Crinnion wasn't there, and the doctor who was there took one look at my leg and urged me to go, immediately, to the nearest emergency room. Which, from there, was attached to Banner Desert Hospital. Where I stayed for 11 freaking hours before they finally admitted me to the hospital. I didn't wait 11 hours to be seen. They have three or four layers of triage doctors and nurses. When you first go in, there's seating for just a few people. But each layer you go through, there's additional seating areas, and more people. In fact, the place was crowded; one nurse bragged that this was the busiest emergency room in the Valley. Which, I thought, was not a reason to go there. As the hours went by, I kept thinking we should just go back to Mountain Vista hospital, closer to home. But surely, I reasoned, I should be seen by a doctor soon after waiting for so long. Each of the medics who talked to me told me to keep my leg elevated, and then sent us to a new area. I would put my leg on another chair, and almost instantly a non-medic employee would run over and tell me to put it down, that the ER was too crowded for one person to take up two chairs. One of them was particularly definite: "Whattya think this is, the Hilton?" he asked rhetorically. The final waiting area was the worst, because they didn't allow spouses or any kind of support person to wait with the patient. They made Jason move to a separate waiting room. When they finally admitted me to the hospital, it was after midnight. I still had a fever. But it was now Saturday. By now my leg was turning bright red, a symptom of cellulitis, which I had about seven years ago. That required a one-week hospital stay. But they didn't start treating it immediately. I didn't see a doctor until sometime Saturday afternoon, after which they started a wide-spectrum antibiotic IV. I don't remember Sunday at all. I have to piece together what happened from Jason's account. Apparently a doctor, Duc Tham, came in and told us that I had to have surgery now or I would die—and even then, he only gave me a 40% chance of survival. He had me sign a waiver or something, and orderlies showed up to roll me away on a gurney. Jason swears I made him take pictures of me being rolled out "for my blog!" But I don't remember being rolled away. In fact the next thing I recall is gradually coming out of sedation, with a tube running down my throat and my hands tied to some railings. I didn't remember being sick or having the surgery; I couldn't open my eyes and I couldn't move my arms. I panicked and began to moan as loudly as I could with that thing going down my throat. It was, simply, the worst experience I've ever had. Eventually a voice told me I had been in surgery and unconscious for two days. The voice barely registered as I was still frantic, trying to break my hands loose so I could pull the tube out. Thankfully someone else did it. I was given a shot of something via my IV and went back to sleep. When I awoke, my daughters Dottie and Karen were there, looking concerned. This was my first clue that I had been in trouble, because both girls live in Virginia. Then my local daughter, Jenny, and my son, John, and Jason of course, and Mary (my ex-wife) and Michael (my ex-husband) came in to see me. I was still confused but gradually Jason helped me understand that I had nearly died; that what I had wasn't the fairly common condition of cellulitis but rather a deadly infection called necrotizing fasciitis…better known as "flesh-eating bacteria". Although the frequency of this disease is on the increase, it's still very rare. In 2004, only about two thousand Americans came down with it. And it's considered to have a 25% survival rate. Dr. Tham had given better odds than I deserved. It had started about two inches from my middle toe, and by the time the surgeon was called, it had spread almost to my groin. "If it had gone another inch," he said, "it would have traveled through that vein to your heart and you would have been gone." The surgeries, I was told, had removed all the skin and about half the fascia (the layer that separates the skin from the muscle) from my calf; and the skin from my inner leg at the knee to about three inches from my groin. It took me a couple of days to get up the nerve to even look at it. The black stuff is not dead tissue; it's a foam they used to seal off the wound. The redness around my calf is bare muscle. 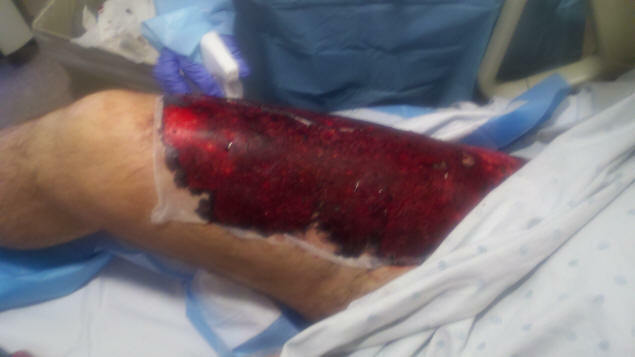 If you think that looks horrible, remember it could be worse…it could be your leg. By the 30th they had my whole leg encased in that foam. 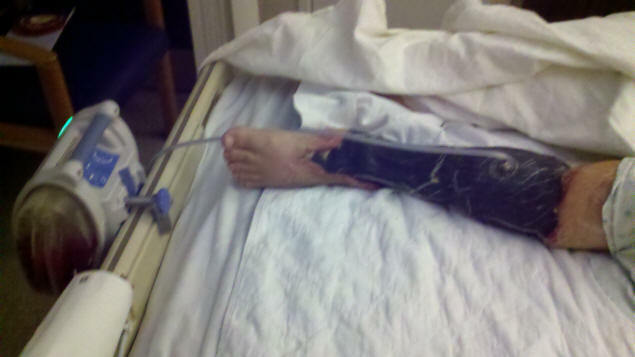 The tube running from my leg to the gadget at the foot of the bed is draining fluids from within the wound. The gadget is called a "wound vac" and it is a vacuum pump that draws these fluids, helping the wound to heal "from the inside out." Since my hospital stay was expected to be a long one, they replaced my simple IV with a PICC line. PICC stands for "peripherally inserted central catheter." They take a tube and feed it from an opening in the upper arm, through a vein, to a spot just over the heart. To be honest, I found it very cool. I had been unconscious when it was inserted, and there was absolutely no pain or discomfort from it whatsoever. Plus, not only was it used to give me huge amounts of antibiotics and pain killers, it could also be used to take blood samples, so no additional needles were needed. 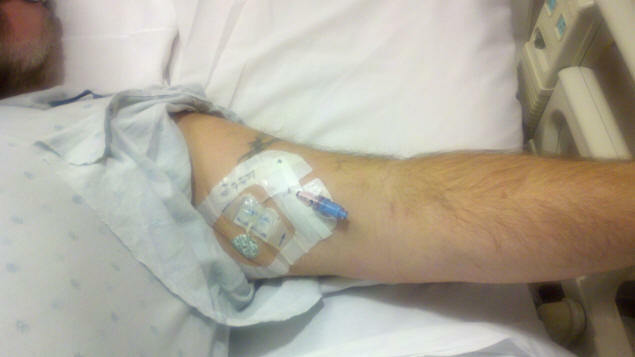 I hate needles, so I loved the PICC line. In total, I had six surgeries including four skin grafts. For the skin grafts, I was my own donor. The first two grafts were taken from my right leg, front upper thigh. The donor site looked pretty awful, but it just felt like a bad sunburn. From left to right, that's Dottie, Karen, Zach, Jason, Barbara, Michael, Mary, John and Rachel. Jenny took the picture. She also showed up with an armload of photos she'd gotten off my computer or Facebook, enlarged, and framed. She arranged the pictures over my bed. No one who came to my room had any doubt I was much loved. Speaking of Facebook, I was also startled to read the outpouring of good wishes and prayers coming from my friends, and from their friends. Knowing so many people cared about me made me cry with gratitude, and I know their thoughts helped me heal. I made a point of posting my condition each day on Facebook and when I couldn't (too doped from surgery) Jason did. Here's the entry from February 9th: "I WALKED from my room to the hospital atrium where a month ago Jason cried thinking he would lose me. I kissed him and pointed out that I'm still here." There had been concern that, after lying in bed for almost a month, my muscles would deteriorate. They sent in a physical therapist who was prepared to show me how to use crutches; but when he saw I could walk without them, he left. His name was also Jason but he reeked of Patchouli Oil; so I called him Patchouli Jason to distinguish him from my Jason. Early on, Jason discovered the hospital supplied cots for spouses, and slept in one for a couple of nights before we discovered that no one minded if we slept together in my hospital bed. After a few nights we put the cot out in the hall for someone else to use. It was snug in the bed but we always slept with our arms entwined anyway so we didn't take up much room. Plus, on the days I had surgery, I couldn't eat breakfast and, perhaps because of the drugs I was on, I didn't have much of an appetite. (I lost 45 pounds in two months, not all of it in the form of skin removed from my leg.) So it wasn't crowded at all, and I credit Jason's presence with much if not most of my healing. I slept a lot. After Jason left at the crack of dawn to go to work, I would have the nurses run some Benadryl through my PICC line and let its side effect, drowsiness, put me out for the next few hours. By the time I awoke, Jason was usually there, waiting for me. I also got something called Delaudid as my primary pain medicine. At first, I was only allowed one dose of 2mg every eight hours. But its effects lasted only four, if that. The nurses wouldn't budge, but I finally thought to complain to one of the doctors who came to see me each day (there were several, each with a different specialty) and he easily changed the order to allow for 2mg every four hours, which worked much better. I didn't always take it, though. I knew there were bound to be withdrawal issues when I finally got out of the hospital, so I waited until the pain got really bad, or I was trying to go to sleep, for a dose. Every nurse gave me the Delaudid differently. Always through the PICC line, of course. But if the two milligrams were given quickly, there would be a rushing feeling just over my heart where the drug was released from the PICC. Other nurses would follow the instructions, more or less, and release the drug more slowly. The first time I felt the rush it scared me, but then I grew to expect it and the relief of pain that quickly followed. One nurse, one night, not a regular nurse and that was the only night I saw her, asked me how I wanted the drug administered. "We're supposed to give it slowly so you don't feel the rush," she said. "But I'm old and cranky and I don't see the harm. So if you want the rush I'll give it to you quickly." I shrugged and accepted the rush. Another drug I got a lot of was Ativan. I was told it was used to relieve anxiety. Well, if I knew I had surgery in the morning, I grew anxious. Then I found if I knew I was having surgery the next week I grew anxious. I also found that Atavan helped me sleep through the night. It wasn't until I got home that I found all these drugs had serious withdrawal symptoms: Chills, loss of appetite, and frequent crying bouts were the worst. One night, while still in the hospital, I suddenly experienced an anxiety attack. I had already had a dose of Atavan and couldn't have another for four more hours. It was very strange. I couldn't stay in bed. Jason was concerned and hurt that he couldn't calm me down, but nothing could. I felt claustrophobic. The dressing on my leg, even my shirt, felt tight and uncomfortable. It took a lot to get the night nurse to actually call a doctor and get permission to give me another dose of Atavan. So, after a month, my calf was covered in grafted skin, which in turn was covered in layers of dressing in a technique called "wet-to-dry", where the inner layers are moist, to keep the new skin moist, while the outer layers are dry, both to keep the moisture in and the bed dry. The dressing was changed twice a day, and seldom did the same person do it twice. So I had to instruct each new nurse in how to do it. Fortunately, Jason watched so when we came home, he was able to change my dressing, something I could have done with effort, but which Jason continues to do with love. I was released from the hospital but when the surgeon found a bit of pus (meaning infection) a few days later, I went into another hospital for a week, with a new PICC line in the other arm. This was kept in, this time, and I received once-a-week medical care from a home nurse. Jason gave me intravenous antibiotics three times a day through the PICC and the home nurse drew blood samples. It was a real milestone when no sign of infection remained and the PICC line was withdrawn. So now I am still recovering. I still have to keep dressing on my leg, though the doctor encourages me to let it "breathe" for an hour or two each day. The official dressing is this: Dab Bacitracin, a general topical antibiotic, on any open spots; cover the remaining open wound from my knee along my inner thigh with gauze soaked in Dakins solution (salt and chlorinated water), then a layer of petroleum jelly on the grafted skin, then a layer of gauze wrapped around the whole leg, followed by a layer of Ace bandages. However, the healing under this regimen was taking forever. So I've been experimenting with using raw, unfiltered, organic honey on the grafted skin and the wound and been amazed at the improvement. I have a doctor's visit tomorrow and I'm pretty sure they'll be amazed, too. They've been remarking at how quickly I've healed so far, though I don't think they believe it's the vitamins and supplements I've been taking all along, plus Jason's love and care, that did it. Two trips to Sedona to immerse myself in the healing energies of Airport Vortex haven't hurt, either. As of two days ago, my leg looked much better than it did mid-January. The grafted skin on my calf, the doc says, will probably always have a pebbly texture and never quite grow to where it was originally. On the other hand, proponents of the raw unfiltered honey cure claim it can heal wounds, like the one on my inner thigh, without a scar. So we'll see what happens. The good news is, I am walking almost normally now; and once all the openings have closed, I can go swimming in open water again. Obviously this has been a wrenching experience. But some good has come of it, including the clearing up of a couple of chronic infections (my spine and the sclera of my eyes). But best of all it proved Jason's love for me to my whole family, who perhaps understandably were suspicious of a 33-year-old who wanted to marry a (now) 60-year-old. But prove himself Jason did, by being with me every single night I was in the hospital, after the first two days when I was unconscious anyway. I don't know what I would have done without his care and presence. Certainly I wouldn't be as far along, healing-wise, as I am now. Some would see this as a tragedy and I admit I've cried over my mangled leg more than once. But I prefer to see it as a positive, albeit life-changing, experience. To do otherwise is to wallow in victimhood, which does no one any good.